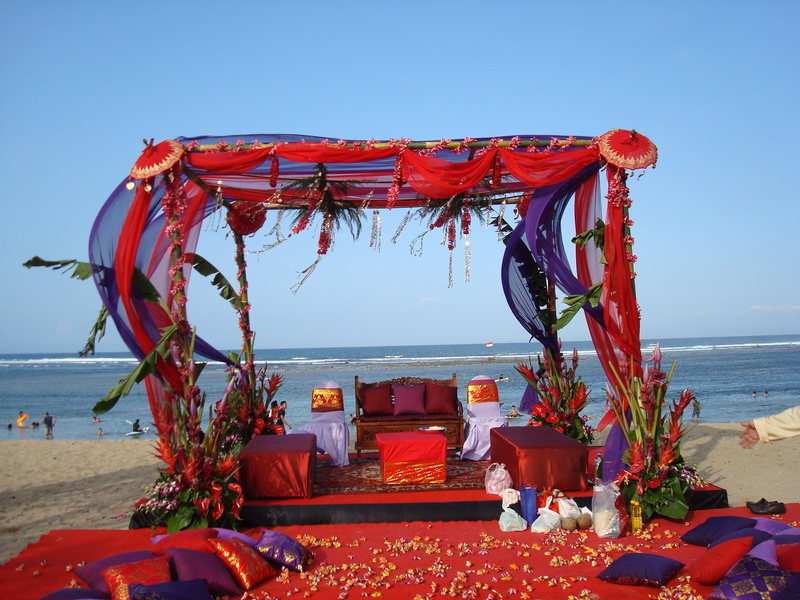 A Bollywood wedding is the ultimate pageant, and a Bollywood wedding on a Bali beach is the ultimate fusion of culture and stagecraft. 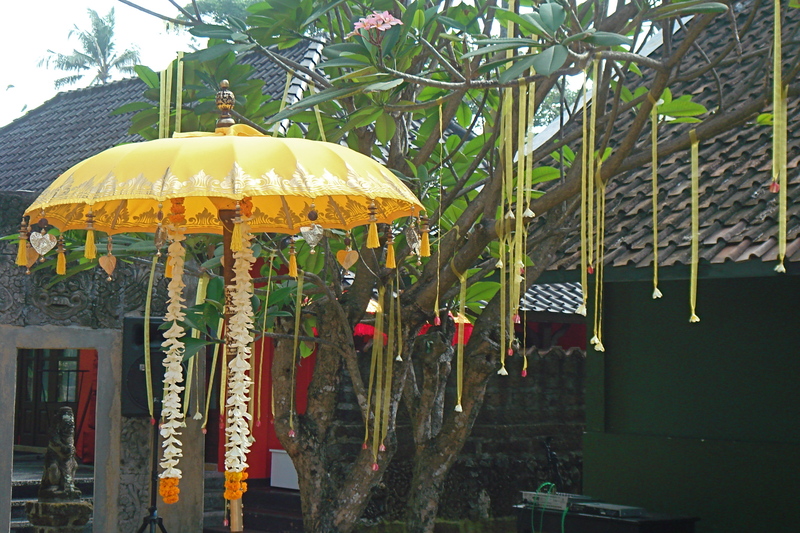 They came from all over the world, the guests, from Mozambique and Mumbai, Boston and Birmingham; from Washington, Texas, Singapore, Calcutta, Jakarta and elsewhere to celebrate a wedding in Sanur, Bali, on the beach, as the sun dipped and the wind soughed and the palms swayed. Cameras whirred and murmured conversations wafted inland on the breeze as the surf crested and broke and the bride and groom walked around the fire. 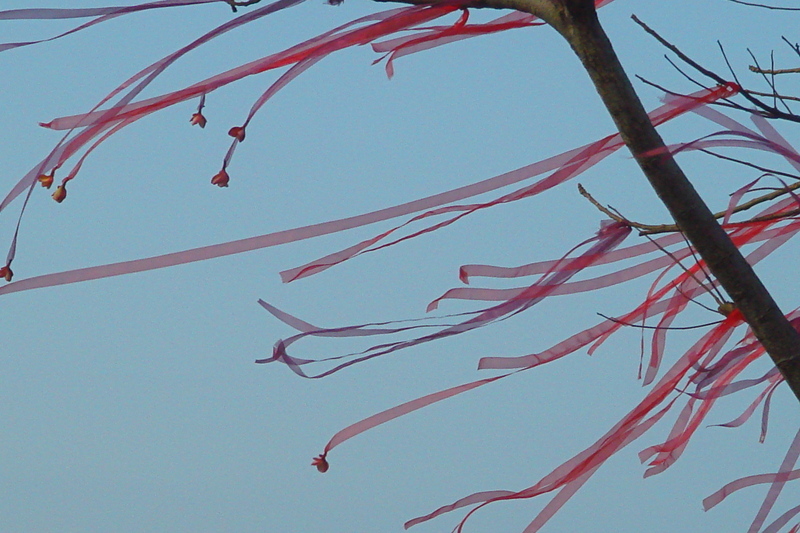 The evening wore on, the skies darkened and silks snapped and fluttered as little pinpricks of light blossomed along the shore. 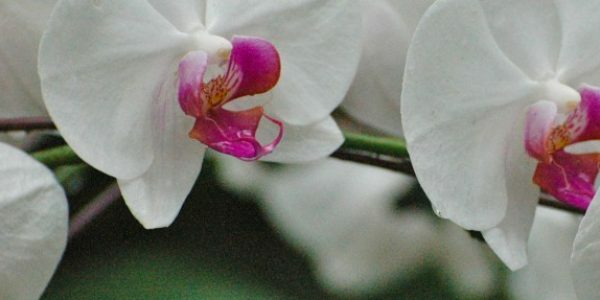 Destination weddings are de rigueur these days, with family and friends traveling great distances and many hours to reconnect, reflect, reminisce. And so it was with this wedding, old friends, young hearts, three days immersed in the now and the moment. Because of the destination, the journey was primarily a holiday, a reprieve from daily minutiae. Because it was a wedding, it was a vigorous and colorful break in every sense of the word, enlivened by song and repast; the rituals and ceremonies resplendent and memorable. An Indian wedding, a Bollywood wedding – the bulwark of Indian cinema – is the ultimate pageant; the colours blaze richer, the ceremonies are intricate and detailed, the attire is quintessential movie magic, the music plays loud, long and late into the night and passions run high. The bride and groom, though Washington based, though Indian (one from eastern India, one from the west) represented two sides of India, their differing customs, languages, food, dress, protocol and etiquette arising from a common bedrock of mores and traditions. So the wedding was – necessarily – a ‘fusion’ one, exemplifying the brightest and best of Bengal and Gujarat, set in a Balinese milieu and interwoven with elements of Balinese life, enhanced with international grace notes. The traditional seat on which the bride is carried to her wedding was painted by a graffiti pop artist cousin from Melbourne, sacred songs in Bengali filled the space between the banyan trees, little Suri from Africa ? America ? scampered around with freshly applied henna on her hand, in quest of snails, (she didn’t know where she was from as she was only five and a half and was in the process of traveling around the world and did I know that I reminded her of her grandmother’s friend, Aunt Amelia Melly Belly ? ), a black American colleague stepped in as the fourth male relative to accompany his friend, the bride, in her ceremonial orbit, an Asian guest rendered each scene in perfect black and white detail on a sketchpad (her wedding gift to the couple), relatives from Mozambique faultlessly executed a traditional wedding dance, a suave young cousin from Texas held the crowd rapt with his easy emceeing and an Indonesian minister joined the dancers on stage, jaunty and ebullient. A wedding is supreme theatre; the tragi-comic elements juxtaposed with somber ritual, and the intensity of the occasion makes it a microcosm of the best and most bizarre in human conduct and interaction. This wedding had it all, lissome beauties, crusty dowagers, dirty old men, nubile skinny-dipping lasses, a hot tempered male relative, globe trotters soaking up the sun in the in-between hours, young men exuding testosterone, tempers held in check, bawdy laughter and whispered gossip. 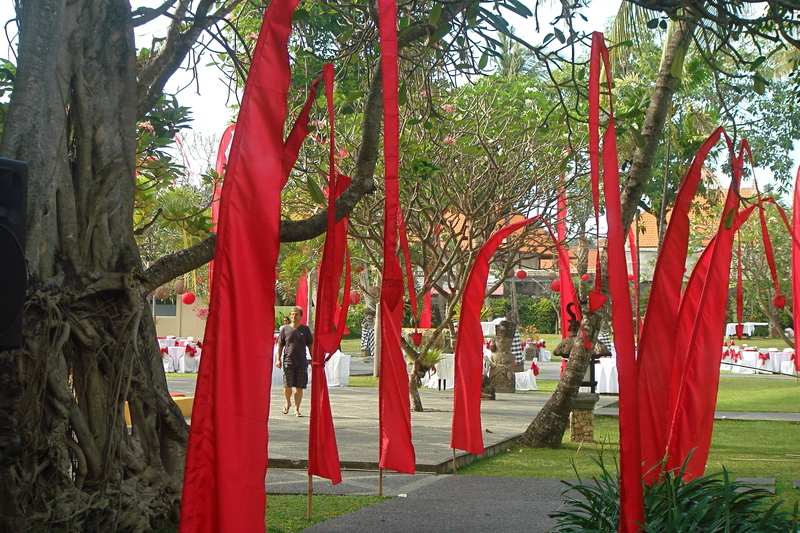 Umbul umbul, the traditional wedding flags (normally seen in Balinese temples) lined the pathway winding through the lawns, past the stone statues of deities, the water lilies, past the priest conferring with his disciple, leading guests to the ancient banyan tree under which a peacock parade of colour and fabric rustled around the bride, the married women waiting their turn to attach golden bells to her wrists. 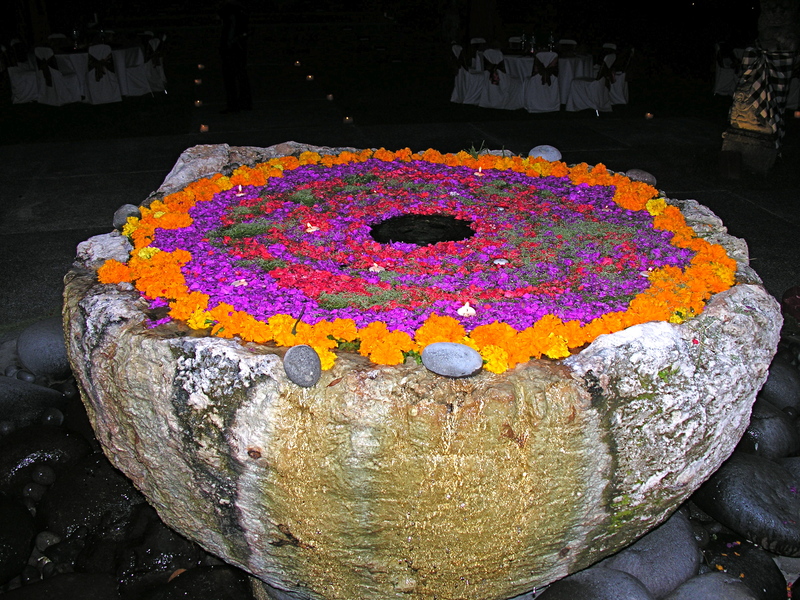 A vast stone urn filled with water floated blossoms, carefully arranged. Waiters in black and white checked sarongs gracefully negotiated the crowds and flashing cameras, a lengthening line of guests queued cheerfully by a counter serving Indian street fare. 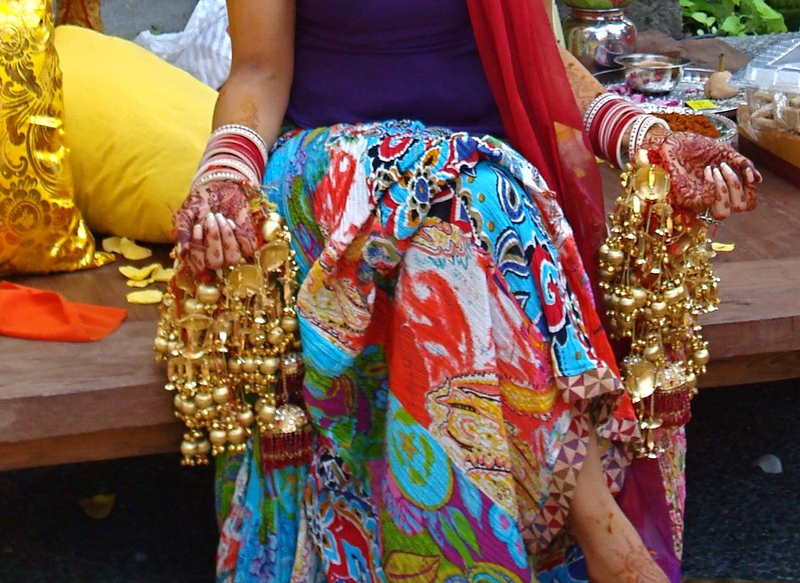 Frangipani flowers graced the ends of every fluttering streamer; flower girls greeted the bride. The tinkling improvisation of the gamelan orchestra saturated the dusk, the last note quivering, suspended. A soaring teenage soprano hushed the audience, a Sanskrit invocation rising to the stars and the powers-that-be, the language, unfamiliar, its essence, universal. 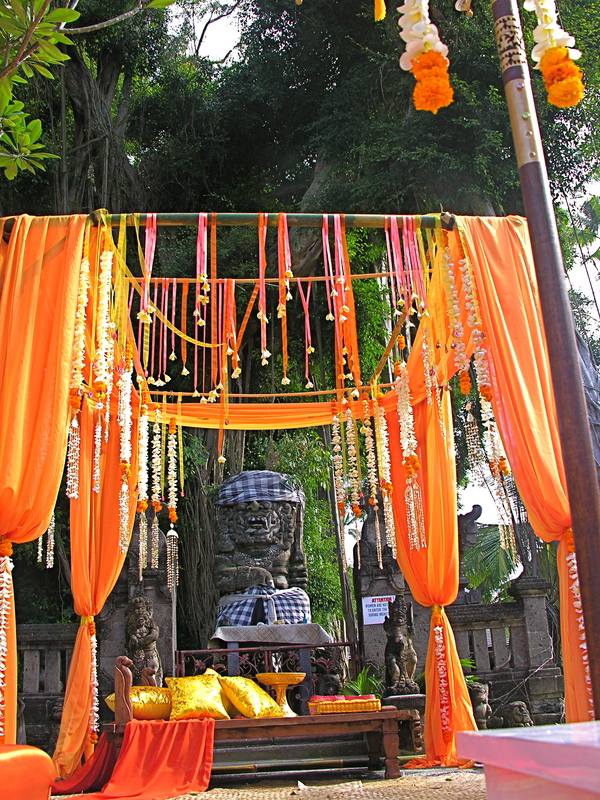 The bride’s father wept quietly and her mother smiled tranquilly, youngsters danced and tourists snapped pictures and boatmen smoked kretek (clove) cigarettes, sitting on their upturned boats, watching the celebrations. And finally, the ubiquitous, beloved Jai Ho from Slumdog Millionaire, rousing the dancers, infusing the revelers with renewed zest. And so it concluded, three days of suspended time, a new life and a new chapter for the couple, for the rest, photographs and memories. And little Suri, who didn’t know where she came from (because she was traveling around the world), Suri will probably not remember the import or the occasion, but she may recall the sensation of sand between her toes and the gay abandon of a star drenched evening when she is grown and knows where she belongs and in her turn, witnesses two lovers pledging their troth.